It’s “Pie Day” here at Spectrum! When our team has birthdays to celebrate, we honor them with a delicious selection of pies from our local Bread and Butter Cafe. This month, we’d like to send a special Happy Birthday to Candy and Shelly, our customer service representatives, and Nick, our die cutter specialist. What do we do when we’re not eating pie? Candy is always a joy to be around and has a great personality, which is very fitting for customer service. Shelly, a self-starter, wears a variety of hats in estimation, customer service, and mailing – she knows what our customer’s needs are and she does an amazing job making sure it happens. Nick, a quick-learner, is helpful with the specific details of a customer’s die-cut request. Some would say pie stimulates our creative printing and marketing juices. 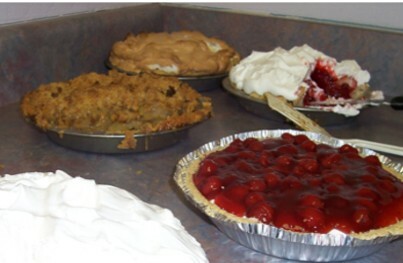 Others know in their hearts that it’s not the pie, but our people that makes a Tucson printing company so spectacular. You can hear our friendly voices each and every time you call – no automated voicemail here. You can see our diligent printers and mailers double- and triple-checking your product without error. You can feel the difference of professional quality at work for you. It’s a good thing “Pie Day” is only a once-a-month celebration because we’d rather focus on serving you, than pie. Without our brilliant team members, there is no Spectrum. Without birthdays, there is no pie. One of our welcoming Spectrum Printing Company team members is available to assist you with your business printing, integrated marketing, and mailing needs. CONTACT US today at (520) 571-1114. Consider the Possibilities.